Recently completed pillar logos now welcome the owners and visitors to the Ghost Eye Ranch in east Bradenton. 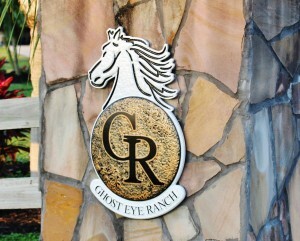 The project began as a request by the owners to provide a durable version of a logo sketch to mount on a gate pillar at the entrance to their property. Initially conceived as a simple flat cnc cut aluminum element painted and decorated with a high resolution digital image site visits inspired our design team to evolve the proposed brand into a more 3 dimensional product using high density urethane as the substrate and introducing texture and color to the piece echoing the textures and color found on items throughout the ranch. The result so pleased the owners that the initial single product became a matching pair of brands adorning each gate post.